einfach super! obwohl mir "we sing, we dance, we steal things" noch einen tick besser gefällt. 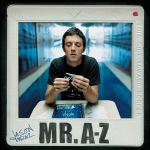 Surprisingly decent album and better than what has come since then (although I haven't listened to his most recent albums) - I think it's probably refreshing listening to a different Jason Mraz that isn't chained down with peppy hits like I'm Yours and IWGU. Not saying that those songs are bad, it's just that those type of songs are him now and it's what I'm used to. But this is different in a good way. He displays his vocal talents well and really soars, particularly in Plane. That's a really good track. All up, I'm impressed. An even 4/6.